Hey Kids!, originally uploaded by datadub. The Fig-lab Finger Five TOOTI FROOTI series is a nutritional start to your day and comes in five wild flavors – Mandrill Mandarin, Caustic Lemon, Hurlin’ Chunky Grape, Hellish Melon, and Blueball Berry. Collect all your favorite characters! Crazy Unca’ Biter! Sarcastic Sucklord SD!! Creepy Chibi Baby Hell!!! Far-out Phase Pheyden!!!! Mischievous MonstreApe!!!!! 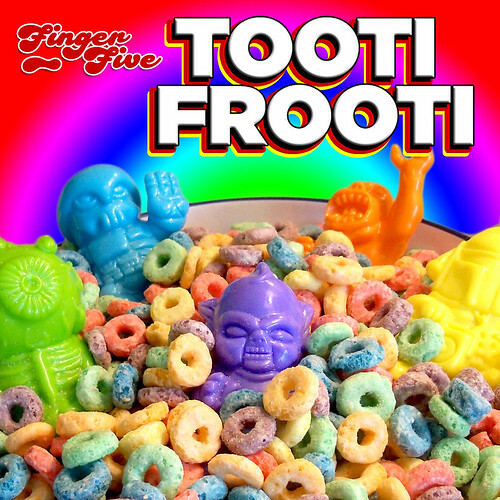 The Fig-lab Finger Five TOOTI FROOTI series will be on sale at the 3DRetro Booth #5051. *While supplies last. Offer not valid in Mordor, Tatooine, Atlantis, Hades, or Lesser Borneo. BREAKING NEWS! : Meet the Hands behind the Fingers: Paul Kaiju and datadub will be doing a meet and greet at the 3DRetro booth #5051 on Thursday from 3pm – 5pm. There will be exclusive customs, secret figures and other surprises! Stop by and pull our fingers!